The glass half-full from the title refers to AZ taking only a point, where they failed to take more distance during dominating spells in the first half. And it refers to Ajax, who managed to fix some issues from the recent Cup defeat against AZ, but left much to be improved in order to refresh hopes of defending their title. AZ went into this match unchanged from the 3-2 Cup win at the Amsterdam ArenA. Maarten Martens, who missed much of the first half of the season through injury, started as the central playmaker behind Charlison Benschop, who saw his excellent performance earlier this week rewarded with another start. Pontus Wernbloom, sold over the winter window to CSKA Moscow, was replaced in central midfield by rising star Adam Maher, who partnered set-piece specialist Rasmus Elm. Frank de Boer undoubtedly had a lot of home work over the past few days, as his team slumped to a miserable performance and a rare home defeat against AZ just three days earlier. A lack of ball retention in building from the back and impotent wing attackers summed up just the most eye-catching problems in the Amsterdam side during that particular match. For this outing he replaced Ismael Aissati, who had all sorts of trouble keeping the ball in his team’s possession during the previous encounter, with Lorenzo Ebecilio, bypassing Nicolas Lodeiro here. A second change saw Vurnon Anita shifted out to right back to replace youngster Ruben Ligeon, with Daley Blind facing up with tricky AZ winger Roy Beerens at Ajax’ left back position. After AZ had dominated the first few minutes of the match, Ajax slowly got more of a grip on the game. AZ by that time had seen Beerens head over from a clear cut chance after an early error of judgement by Blind. As so often is the case with two formations that effectively cancel each other out, it were midfield choices that proved influential early on. Rasmus Elm stuck close to Christian Eriksen and Adam Maher did likewise with Theo Janssen. This left Eyong Enoh with a lot of freedom during Ajax’ spells of possession. In return, when AZ had the ball, Janssen and Enoh did a decent job of marking Maher and Martens, so that Elm was AZ’s main focal point in midfield passing. The end result of this simple piece of math was AZ being more able to convert their possession into goal scoring chances, drawing on Elm’s distribution qualities. Furthermore, as expected, Roy Beerens kept having the better of Daley Blind, while, at least for the first half, the latter’s offensive input did not make up for the defensive frailties induced by his presence. An interesting tactical difference with the match just three days earlier concerned a key concept of modern football tactics: pressing. While Ajax lack all sorts of pressing in the previous match, and paid for their high line as a consequence, they had a better grip on their opponents this time around. When possession was lost in AZ’s half, the AZ players were well pressured, often resulting in counter attacks being eliminated early on. However, Ajax still display a strange attitude towards possession of the ball. All too often, possession of the ball is deemed a goal in itself, and a dangerous sort of round-about is initiated in their own half. By now, opponents know that Ajax values possession that highly that they are willing to voluntarily re-circulate the ball among their centre-backs and goal keeper, even under severe pressure. This led to repeated losses of possession on their own half, under AZ pressure, which should be credited too. In short, more Ajax pressure allowed AZ less opportunities to take advantage of the space behind the defensive line and exploit Benschop’s pace, but Ajax’ own half give-aways under AZ’s pressure were all too frequent. And it was one of these simple own half give-aways that led to AZ’s first goal. Enoh failed to complete a pass inside Ajax’ own third of the pitch, leading to a dangerous turnover from which the free-kick occurred that Rasmus Elm fired home, scoring his fifth direct free-kick of the season. While one might have expected AZ to take advantage of the situation, they seemed to lower their level of pressure in the second half. AZ defended closer to their own goal, making it harder for them to capitalize on turnovers, which Ajax still granted now and then. At the hour mark, De Boer made some changes. Eyong Enoh, yellow carded already, was removed for Bulykin to enter as the new striker, with Siem de Jong taking a central midfield role. This saw Theo Janssen return to the deep-lying playmaker role that was thought out as Ajax’ plan A before the season had started. It’s a pity that in-match data are still not available for the Eredivisie matches, as it would probably have been much easier to demonstrate Ajax’ second half performance with some chalkboards at hand. Christian Eriksen might be isolated as the driving figure of Ajax’ improved second half performance. 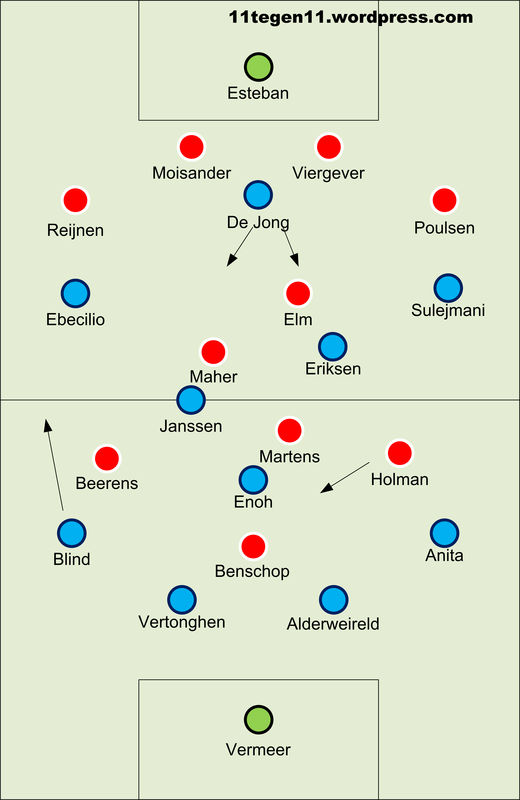 Partnered by Siem de Jong and Theo Janssen, rather than Janssen and Enoh in the second half, he turned in a marvelous passing performance, resulting in longer spells of Ajax possession and a significant higher fraction of defensive possession being successfully transferred into final third attacks. With Nicolas Lodeiro having replaced the ineffective Lorenzo Ebecilio, Ajax started to find their rhythm. In a left wing move, where Daley Blind should be credited for providing the offensive input that warranted his selection today, Lodeiro pressed Poulsen into conceding an own goal equalizer. At the same time, AZ had had some opportunities of themselves, as Ajax defended further away from their goal and the offensive minded midfield failed to consequently press AZ’s technically skilled midfield enough. Overall, a draw would feel like a reasonable result to this game, where AZ clearly won and dominated the first half, and Ajax saw their risk-taking later on rewarded. ← Offenses and defenses in the Eredivisie – Where were we? Key problem for Ajax all season long has been an ineffective midfield. Enoh has limited ball and passing skills and turns the ball over in his own third. Janssen is a very static player, cannot defend and is too easily marked out of the game leaving Eriksen much to make up for. Unfortunately injuries have prevented Anita from displacing Enoh and de Boer relentless (and IMO unfounded) faith in Janssen have prevented experimentation with Lodeiro in the midfield (de Jong who started there at the beginning of the season is hopeless). I don’t think things will improve much until this is rectified. The game was decided, unfortunately, entirely by the wind. The gale blowing down the pitch meant that the team kicking in teh direction of the wind had an extreme advantage. In Australian Rules football, they talk about the of the wind as a factor in the result: a 4-goal wind, an 8 goal wind (being the number of extra goals the team can expect to score in a quarter of football. with 4 goals per quarter being the standard, non-wind-assisted score). The wind at Alkmaar on Sunday was a real 8-goal wind, and the only really notable feature of the game was the way de Boer substituted all his small, fast players on to the pitch in the 2nd half in order to take better advantage. Unfortunate really, as I was looking forward to a good game; but instead, given the conditions, 1-1 was about the only just result.